Natural night cream enriched with super nourishing oils, like Tamanu Oil™. Our night cream minimize the appearance of fine lines and increase skin elasticity, hydration and restore smoothness. Your skin feels very soft after applying the facial cream. Facial Night Cream contains special compound ingredients including Tamanu Oil™, Coconut Oil. your face, renews the skin cells, prevents the tissues from being damaged. of fine lines while helping to increase skin elasticity, hydration. We believe that we are all “connected” to the earth’s energy.....the stronger the connection, the stronger and healthier we become. We focus on the skin and hair of people, animals and believe in the force of nature. 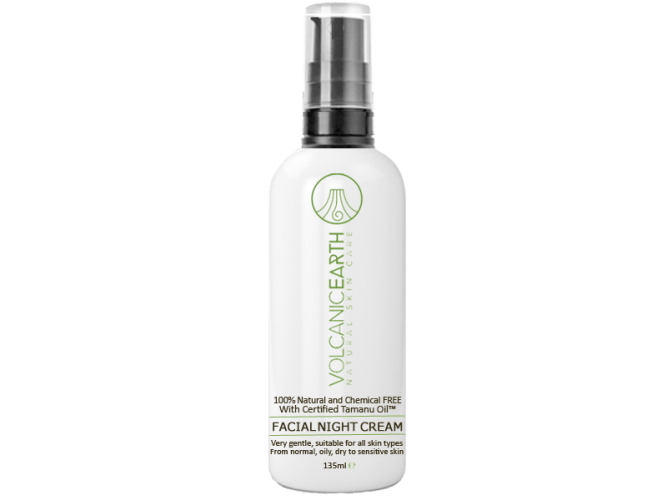 VolcanicEarth products are free of: Parabens, Perfume, artificial additives, silicones. We even take care of the bottles.